I remember seeing that intro while having start to transition on PC... and though, wow.. the design keep innovating! If only I knew that still in 2018... new C64 stuff cameout and I keep being impress and interested by the C64 scene. Tristan/Napalm - Rich/Napalm - It's been over 20 years, when are you going 2 check irc spidernet? Overseas was always better in the demo scene, USA was lazy... or 2 busy in the h/p side of things. FBR for quality intro screens :) You don't think G0Dz gift to the c64 ie:Ronski is pure quality? #c64 channel is still active. Probably my favourite EMPIRE intro ever. I remember i ripped music from the game shadowfire and used it in this intro. So simple and yet still one ofmy favourite c64 tracks ever to this day! 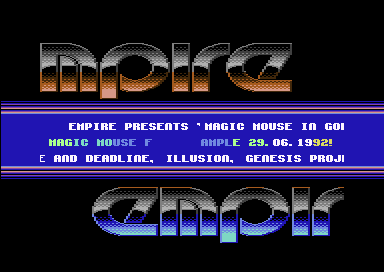 What was so cool also with this introis were the different shades of color used in the empire logo that made it look like they were new colors on the C64. "Empire tried to use as much talent from the american demo scene as possible." Interesting statement, considering that Empire had a very slick, European look to their intros. U.S. groups normally couldn't come up with an elegant intro design to save their life, which is why many outsourced to European groups like Sphinx. All the U.S. stuff (L'RU and FBR come to mind) was absolutely horrible. Empire's intro design on the other hand was very slick and elegant, very European, which is why I find your statement that American talent was used really interesting. I can remember wanting an intro with the logo doing the little flicker thing. I had seen the effect in some other intros and demos and It hadnt been used in a while. It only looks correct WITHOUT an emulator and running on an ntsc machine. I cant remember who the coder was but he was from eclipse. Empire tried to use as much talent from the american demo scene as possible. I can remember having the guy on the phone and him coding it in like 2 hours.